Over the last 20 years of chimney sweeping, I can recall several stories from customers about chimney fires that occurred because someone threw wrapping paper, boxes, or some sort of highly flammable materials into the fireplace to dispose of them. The result of the excessively high flames ignited combustible buildup in the chimney flue resulting in an embarrassing visit from the local fire department. Luckily, the owners and their homes survived to reminisce about the excitement in the midst of family celebrations, but a common conclusion most all drew from their near catastrophic experience is the need to have their fireplace and chimney cleaned and inspected each and every year. Proper chimney cleaning removes the combustible creosote buildup from the chimney flue and inspections make sure the unit and the chimney are safe to use for another season. Let's face it... things wear out, and if they are not checked regularly, problems can arise. Here is a basic list of things your chimney sweep should check each year to keep your chimney in tip-top shape. Depending on the type of appliance (fireplace, wood stove, pellet stove, gas logs, etc. ), there are several areas that need to be checked to make sure they are a safe distance away from the heat source. Fire Code NFPA 211 requires clearances meet the requirements of each manufacturers published standards, so it is very important to have a knowledgeable chimney sweep in order to keep your appliance or chimney from exposing combustible materials in your home to excessive amounts of heat. The combustion process creates byproducts that accumulate inside the chimney flue. 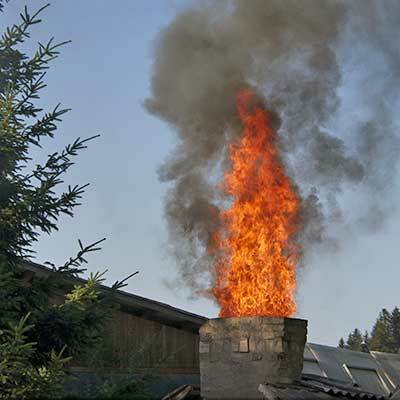 Many people believe that if they burn dry hardwood that their chimney does not need to be cleaned. This is simply not the case. If you burn wood, you create buildup in your chimney which needs to be removed periodically to keep your appliance running safely and efficiently. You should schedule a chimney cleaning every year to make sure your family is safe. Chimneys are exposed to the elements 24/7/365. Most other portions of the home are covered by the roof. Improper construction techniques and freeze thaw cycles can cause water to enter the appliance and/or the home which can cause thousands of dollars in damage and create hazardous situations in the chimney or home. Fireplaces and chimneys are intended to be built to withstand the high heat and highly corrosive environments that are created by the combustion process, but everything ages with time. The metal components used in the construction of these appliances and chimneys are susceptible to failure after exposure to moisture, over-firing, or just years of use. The use of the wrong types of mortar and improper masonry construction techniques result in the premature deterioration of mortar joints inside fireplaces and chimneys. This can cause firebricks to dislodge or expose combustibles to excessive heat. This list of areas to check on a regular basis is not all inclusive. Many different scenarios are presented each day to be evaluated on a case by case basis by your chimney sweep. The key to having safe and trouble free experiences with your fireplace lies in the knowledge, training, and experience of the chimney sweep that you choose to clean and inspect your wood, gas, or pellet burning appliance in your home. So, before gathering the family around the fireplace and roasting the chestnuts on an open fire, make sure you have the fireplace and chimney inspected and cleaned by a qualified, licensed, and insured chimney sweep company. Have a safe and Happy Thanksgiving, and a Merry Christmas from our family, to yours. Contact A-1 Chimney Pro to schedule you chimney cleaning and inspection today!